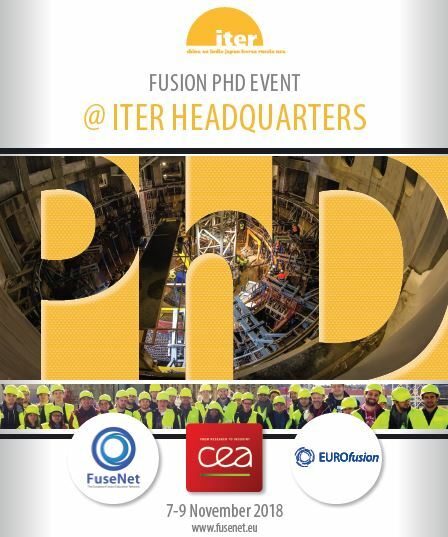 It is with great pleasure to announce that the ITER Organization will be hosting this year’s Fusion PhD event. The event will take place 6 to 9 November 2018 at the ITER Headquarters in Southern France. The three-day event, financed by the education platform FuseNet, will offer tremendous opportunities to discuss and exchange with researchers from the international fusion community. And as a new feature this year, a special incentive event will give you the opportunity to interact with representatives from the fusion industry. A new page with all posters, presentations and more ! Take a sneak peek here to start exploring. You will find all informations concerning the Fusion PHD. List of presentations, list of posters, Facebook link to all photos and a short event video. There will be three buses taking you from Aix-en-Provence to the ITER Headquarters every morning (and back at night!). The buses will all depart from hotel Concorde at 7:30am, please make sure to be there at least 5 minutes in advance. Passport : Please bring your passport or ID !! This is very important, as you won’t be allowed to enter the ITER site without !! Opening party is organized at the brewery Aquae Maltae. The buses will depart from hotel Concorde at 7-30, please make sure to be there at least 5 minutes in advance. Don’t forget your ID/passport!!! It is necessary to have it with you to get your ITER badge. Dinner party will be held in Château de Cadarache. Is there a dress code? No, come as you are ! The buses will return to Aix 10:00pm, 10:30pm and 11:00pm. After the program, the buses will depart ITER Headquarters at about 2:00pm to go to Aix city center (arriving at ~2:45pm), TGV Station (~3:15pm) and the Airport (~3:30pm). Weather in Provence in November is usually rather warm with daily temperatures around 15C, but keep in mind that the rain and strong cold winds tend to randomly appear and disappear, so grab some properly warm clothes and an umbrella. Bad news : Be prepared that only a few shops work after 18:00-19:00, and even fewer work on Sundays ! Good news: there are around 700 restaurants and cafes in Aix city center alone, and the majority of them work till ~midnight. So if are in for a late bite, you surely can find something for your taste/wallet. There is also a small supermarket in vicinity of your hotels which works till 11:30. The nearest 24 hour pharmacy is ~10 min walk away from your hotels. Aix generally is a very safe town, but it’s better to avoid walking alone around Gare routiere late at night. French, very occasional English. Generally it is very appreciated if you start a conversation in French. As was mentioned, Aix certainly doesn’t lack dining/drinking out options, but the most lively and popular among students places to be mentioned are bars in rue de la Verrerie, place des Cardeurs, place Richelme, and bar Sextius. -Departures from Marseille Airport: every 30 min from 5:35am to 11:40pm, last departure 12:25 midnight. Round trip costs ~14 euros, single trip ~9 euros. Tickets can be purchased on board. The trip takes ~30-50 min depending on the traffic. The same bus #40 makes a stop at the TGV train station. Round trip costs ~7 euros, single trip ~5 euros. Tickets can be purchased on board. The trip takes ~20-40 min depending on the traffic. Google maps are not an optimal tool to use to search for public transportation in Provence. Instead, we advise you to use lepilote.com and check for updates and possible roadworks. If you’re younger than 25, a “youth card” can be purchased at the Gare routiere which allows unlimited trips for 2 euros/day. Taxis in Provence are very expensive, but carpooling Blablacar.fr is quite popular. Posters should be in an A0 format, portrait orientation. This year, the oral presentations are set up in PechaKucha style. This means 20 slides, 20 seconds each, so 6:40 min in total. The best presentation will receive an Award. Lunches will be provided free of charge in the ITER canteen.